A large number of injectors are flow tested. Then, injectors that flow similarly are put together into groups. This assures that the set of injectors you receive all flow the same, for the least amount of cylinder to cylinder variation possible. This is something to consider for larger injectors (60's and bigger) for people who are really pushing their cars to the edge. However, for many people, non-flow matched injectors are good enough for their purposes and at a lower cost. Any injectors that are Out of Stock are typically back in stock within a week or two. We try to keep them in stock as much as possible. Set of 6 42lb SMP injectors. Works well on Turbo Buicks from stock to mid 11's safely in most cases. Part# 01D030B. Depending on what car these are used on, you would require a new chip, or ECM programming to work correctly. Set of 6 80lb injectors (Siemens). These may look skinny but they fit perfectly in the Turbo Buicks. Good for cars looking to go 9.80's to 11.0's in the 1/4 on race gas, or down to around 10.70's on E85 (maybe faster depending on combo). Requires no ECM hardware modifications (will require matching chip or programming). Not for 84/85 Buicks without an 86/87 ECM. Typically flow within +/-2% of each other. Very good street manners for an injector this big, almost as good as the 60's. Be aware that a 255LPH single intank fuel pump can only supply enough fuel for 60lb/hr injectors. To use the full flow of these, you would need around 340LPH or a double pumper setup. Set of 6 flow matched 80lb injectors (Siemens). These may look skinny but they fit perfectly in the Turbo Buicks. Good for cars looking to go 9.80's to 11.0's in the 1/4 on race gas, or down to around 10.70's on E85 (maybe faster depending on combo). Requires no ECM hardware modifications (will require matching chip or programming). Not for 84/85 Buicks without an 86/87 ECM. These are flow matched to within +/-1% of each other. Very good street manners for an injector this big, almost as good as the 60's. Be aware that a 255LPH single intank fuel pump can only supply enough fuel for 60lb/hr injectors. To use the full flow of these, you would need around 340LPH or a double pumper setup. Set of 6 flow matched 120lb injectors (SMP). These are low impedance injectors, so if using the stock ECM, it needs to be modified with drivers for low impedance injectors. These are flow matched to prevent some cylinders from being leaner than others. 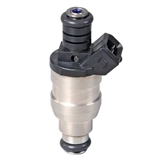 These sometimes come in a black color or may be bare steel, but it is the same exact injector. Depending on what car these are used on, you would require a new chip, or ECM programming to work correctly.